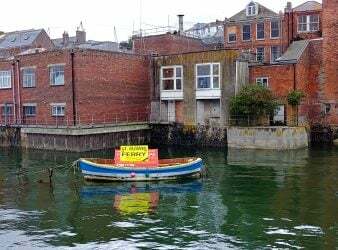 It was one of those tip-based walking tours. You know the type? The tour is free, but at the end, you tip the guide what you think it was worth. 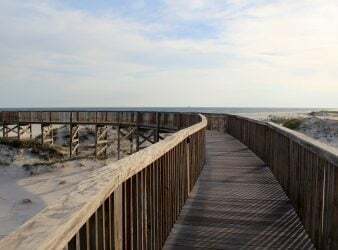 My husband and I have always found this an enjoyable way to begin learning about a destination. Eugenia was our Porto walking tour guide. In her pleasantly accented English, she introduced us to the history and architecture of Portugal’s second largest city, as well as some of Porto’s most fascinating and fun features. 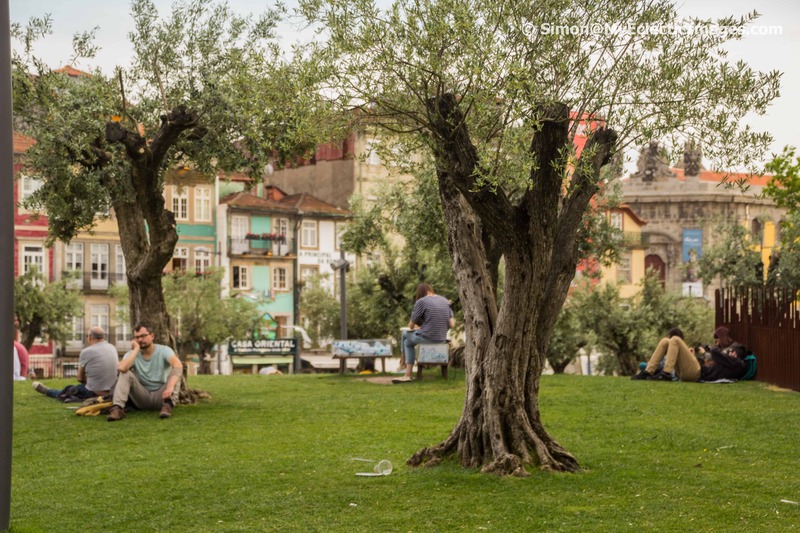 Porto has a population of approximately 240,000 of some of the friendliest people you’ll meet anywhere. Eugenia represented them well with her genuine love of Porto, her humor and her ability to spin a good story. She regaled us with her fascinating tales during our two-hour walk from Porto’s historic district down to the trendy shops and restaurants along the Douro River. We returned to Lello later in the day, and it was everything Eugenia promised. The architecture of the two-story structure was a unique blend of Neo-Gothic, Art Deco, and Art Nouveau. The red spiral staircase, with its whimsical configuration, began as one set of stairs at the ground level. It then divided with each branch flowing in a curve upward in a circular motion until they once more became one at the second floor. This immediately brought the grand staircase at Hogwarts to mind with its illusion of ever-changing movement. Meanwhile, a large colorful stained glass skylight cast etherial light over the entire interior of the bookstore. 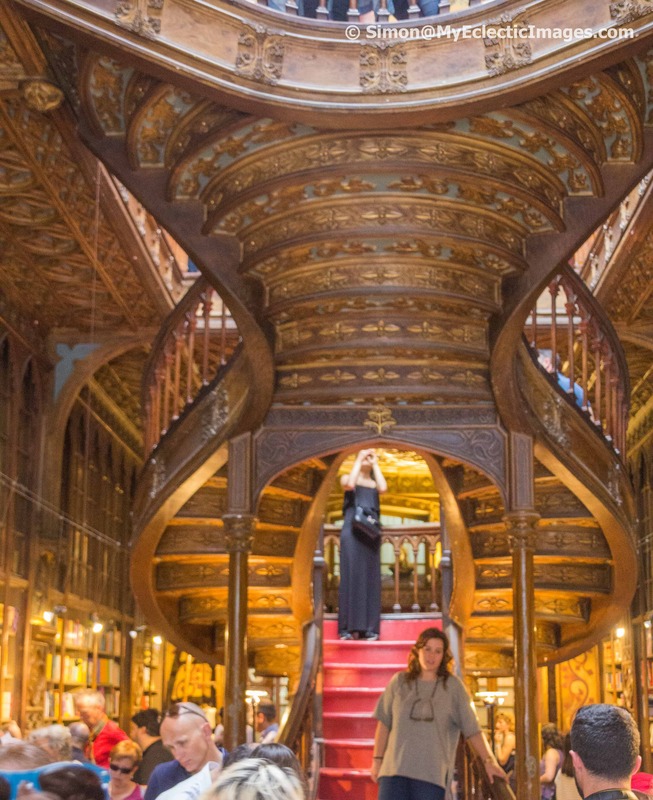 Lello opened in 1906, as a location where book lovers could freely come and go. But due to increasing numbers of ‘Potteristas’ wanting to get a glimpse of Hogwarts, Lello instituted a 4€ admission fee in 2015. If you buy a book, however, the fee will be put toward the purchase price. 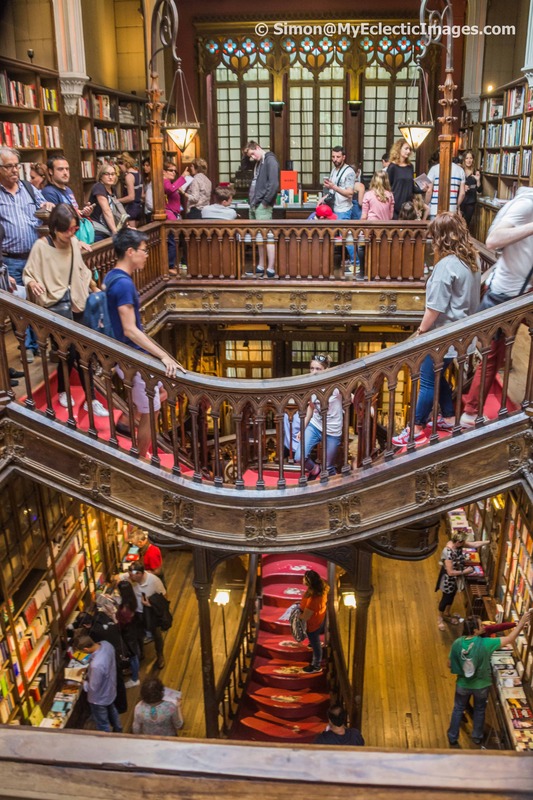 What ever your reasons for visiting Lello, the best time to go is after 6pm when the line is short and the store is less crowded. No walking tour would be complete without a discussion of local cuisine, and this one was no exception. Eugenia extolled the virtues of Porto’s fresh seafood, delectable pastries and told us a story about how tripe – the lining of a cow’s stomach – became part of Porto’s culinary tradition. But the one food item she insisted we must try? A sandwich known as a Francesinha. Invented in 1960, the name means ‘little Frenchie’. Building this iconic Porto sandwich involves layering generous amounts of roast beef, ham, fresh sausage, and a fried egg. Bracket the combination between two slices of bread, slather the top with cheese, toast until the cheese becomes melted and gooey, then drench the entire hot mess with a tomato and beer sauce. And there you have a Francesinha. 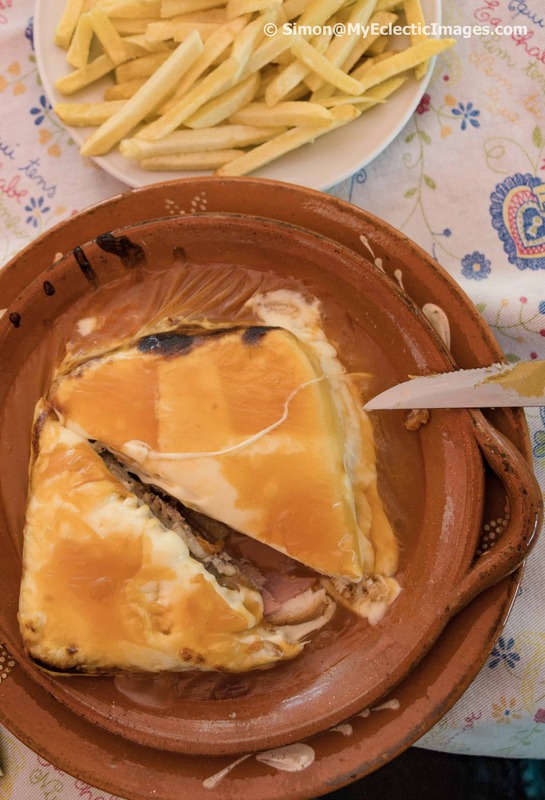 This nutritionally bankrupt dish is often called ‘heart attack on a plate’, but it has become so popular with locals, Porto on a plate makes a more fitting moniker. In the interest of research, my husband and I shared a sandwich and accompanying fries. We found it more than enough for the two of us. In fact, sharing is the suggested form of eating a Francesinha. The sandwich was a true treat for the taste buds. The combination of fresh ingredients smothered in the simple savory sauce could easily fall under the category of comfort food. “Nothing is impossible except not to like a Francesinha,” Eugenia insisted. And we would have been hard pressed to disagree. My husband and I never set foot in fast food restaurants when traveling. But at Eugenia’s gentle prodding, we did just that at McDonald’s in Porto. 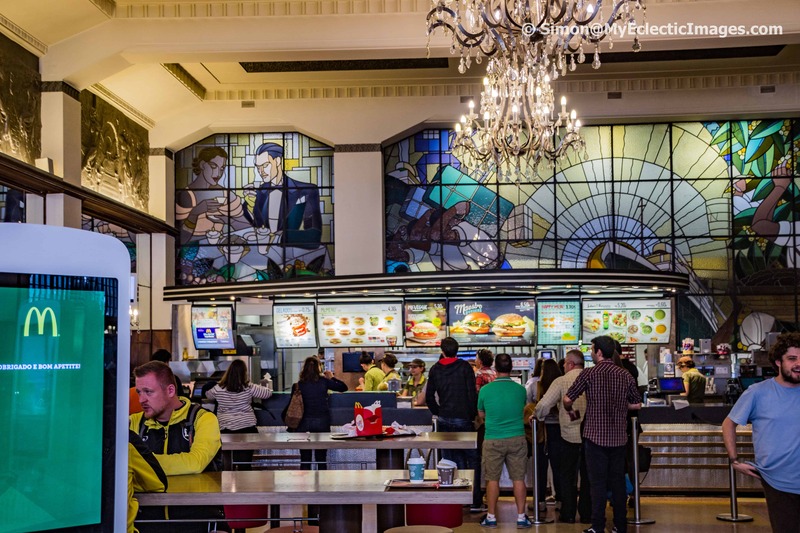 “This is the most beautiful McDonald’s in the world,” Eugenia proclaimed, and she may very well have been right. At first glance, the interior looked like a McDonald’s, and it certainly smelled like one, but that was where the similarity between familiar and stunning reality ended. We never could have imagined a magnificent Art Deco building as a McDonald’s location, but the exterior was only the first surprise. Sparkling chandeliers, a shiny copper and brass counter and the story of the building’s glory days in stained glass graced the interior of the restaurant. At the rear of the restaurant the stained glass panels clearly represented the former cafe’s theme: people picking coffee beans, coffee ready for shipping, workers unloading coffee and a couple enjoying coffee in the café. Porto offers a smile and a surprise around every corner. Eugenia made certain we experienced as many of them as possible during our tour. Here are a few samples. In the heart of Porto stands a small shopping center with a complete park on its rooftop. The park sports no fewer than 50 olive trees. Sao Bento Train Station takes decor to a new high with 22,000 colorful tiles depicting historic, patriotic and religious themes. The strip of tiles running along the top tells the story of transportation throughout history. The Clerigos Tower soars nearly 250 feet into the blue, clearly visible from all parts of Porto. 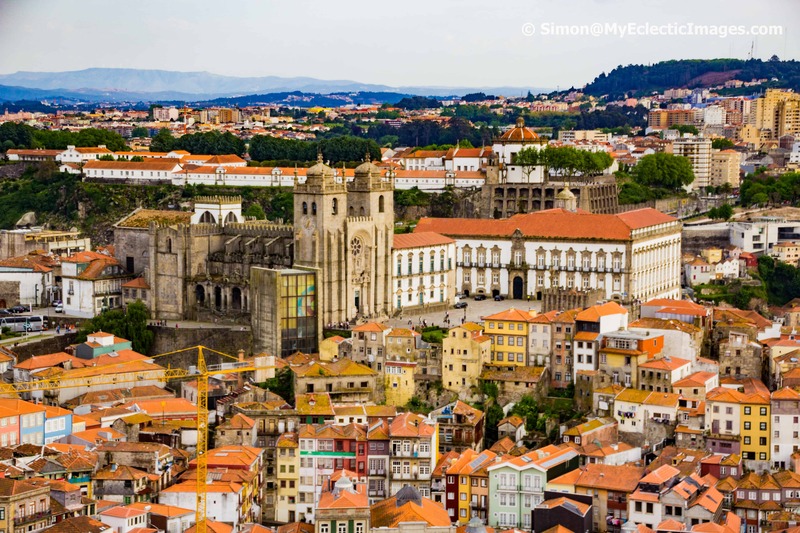 For 4€ you can climb the 227 steps and drink in a stunning 360 view of Porto and beyond. Fado is Portuguese folk music. Themes are mostly melancholy. Despite its beautifully haunting melodies, listening to Fado is not particularly recommended to brighten a sad mood. Fado imparts a sense of longing. Eugenia brought us to a shop that sold classical Portuguese guitars. There we listened to an instrumental Fado song from which I could feel the sadness in every note. • Dates of Porto’s major floods are inscribed on a building façade close to the river. Each date is placed at the level reached by the flood waters. The worst came approximately seven feet up the wall in 1909. 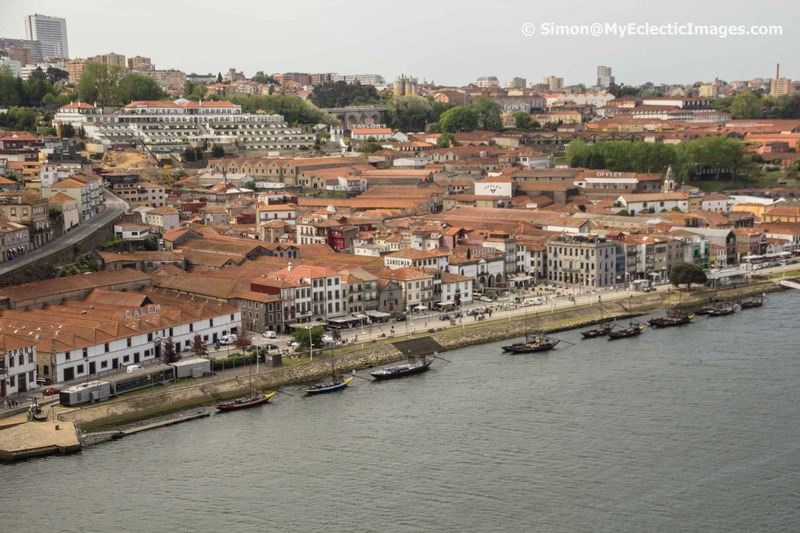 • We walked partway across the upper level of the double deck metal arched Dom Luis Bridge that spans the Douro river to Porto’s twin city, Vila Nova de Gaia. On a clear day, excellent photo opportunities abound. Neither two hours nor two days are enough to fully indulge in Porto’s delights. I suggest you allow yourself three or more days to savor the sights, sounds, smells and tastes of this ‘beautiful’ Portuguese city. Looking for a place to stay? Checkout our MilesGeek review of Yeatman Hotel. Fantastic journey through Porto… definitely felt like I was there experiencing the walking tour with you, Simon and Otto, Penny . I knew very little about Porto except for its connection to a famed beverage before your guided eye-opening experience. Evocative photos put me right there with you. Porto is high on my “to go” list now. Great job! 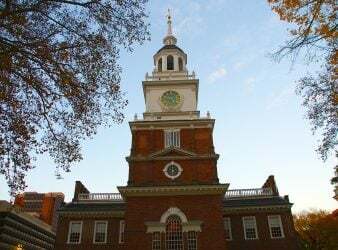 One of my favorite cities and your walking tour sure uncovered a bunch of hidden gems! Love your photography!